This entry was posted in Cooking, Food, Humor, Longform, Narrative, Podcast and tagged Culture, Family, Food, humor by Anita Rosner. Bookmark the permalink. 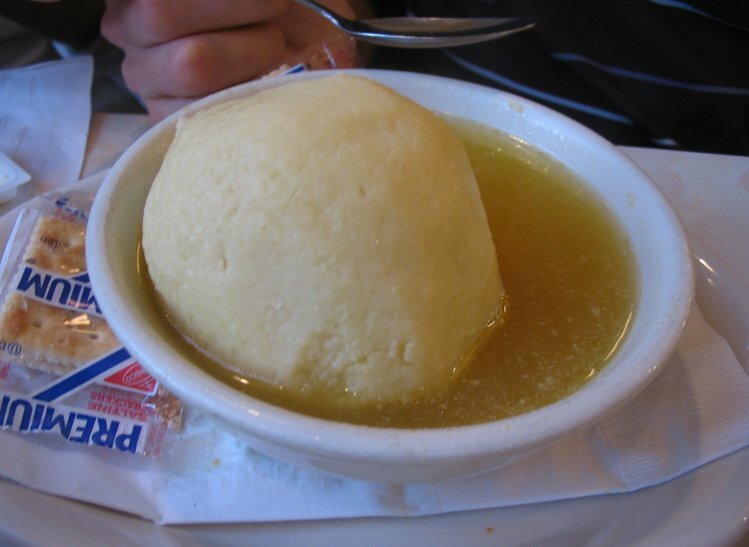 Oh Anita, this matzoh ball story brought tears to my eyes. I remember it like it was yesterday when you asked me for my recipe. I never knew that they expanded when cooked,and I have been eating them all of my life. Snork, hahaha, Snork, Snork, Shork, Hahaha!!! SOL (Snork Out Loud)! Anita, you are a true treasure. lol to your Matzo balls. I was hysterical with laughter. The photo….so so funny. I can only imagine what was going thru your head as you brought the bowls to the table! Great story! Amazing that his Mom allowed him to marry you, but knowing you it was a slam DUNK, matzoh ball and all. Thanks for the laughs. Manischewitz is my M-I-L “family recipe” also! Only she adds soup greens. LOL. Hahaha, Donna! Those are not my saltines! That was too funny! Your husband is a good man !! !